Moving outdoors (preferably in nature) clears your mind and reawakens your body to new muscular patterns of movement. To stay young in body and mind, you need to consistently get out of your comfort zone, get outside, and keep moving! 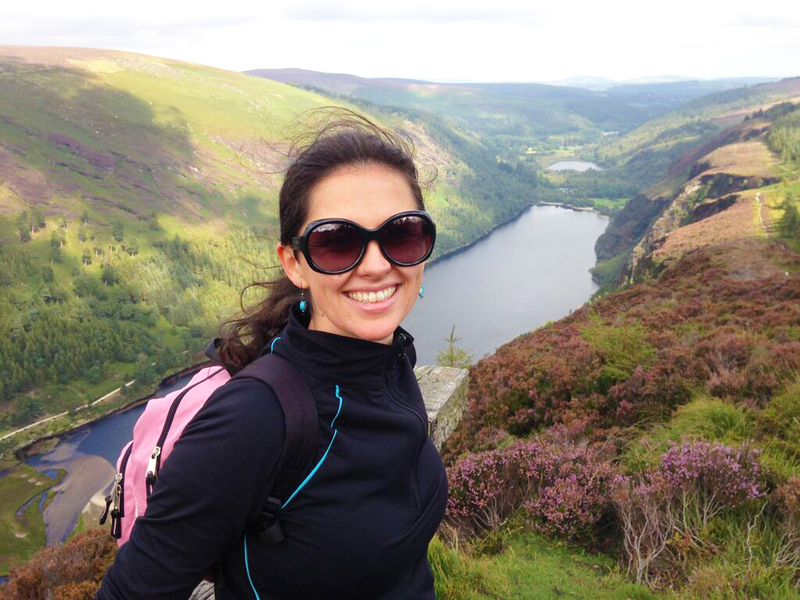 Recently, and in the absence of a ticket to Electric Picnic, my husband and I marked our 10th anniversary ‘Kennenlearnen Tag’ with a 3 hour hike in beautiful Glendalough, Co. Wicklow. Glendalough is well worth the visit. Founded by St. Kevin in 6AD, it features a monastic city, a round tower standing some 30m tall, and Kevin’s Bed, a cavity int he cliff beyond the settlement. The trees and lake surrounding the monastic site emit a pure, spiritual energy, evoking centuries of human meditation and prayer. There are hiking trails to suit all levels. We followed the White Trail, a 3 hour hike covering 12k in total when you include the walk from the car-park to the start of the trail. When you’re training for a marathon it all counts right?! Surrounded by nature, I noticed 20 minutes into the hike that my right shoulder, which had been nagging at me for months now and was ‘frozen’, felt completely free. My husband noted that his knee (operated on last year) felt strong. We passed by sheep and deer as we made our way through the miners village to the foot of the hill. It felt great to be out and able to climb all the way up the side of the waterfall running down from the top of the hill. Higher up, the mountains glowed bright purple with heather in bloom. Crossing over the stream at the top, we continued along the board walk that runs all the way along the summit, back down towards the woods above the visitor centre. We enjoyed the views down into the valley below, overlooking first the Miner’s Village and lakes beyond. It was a bright sunny day, with trees and tourists alike enjoying the best our Indian Summer had to offer. After finishing the hike, we sat by the river that flows down from the waterfall above and dipped our toes in the cool, invigorating water. Though my legs were feeling the effort from the descent, my mind was calm and clear. Feeling energised yet completely at peace, I reflected with my husband that “it’d be hard to have a fight here”. He agreed! After 3 hours hiking together, in this place so tranquil yet vibrant, we felt alive, and buzzing with energy. The trees glowed with pure health and vitality. Their leaves neon green, soaking up the sunlight and radiating life energy for us humans to freely tap into. Glendalough is a beautiful, special place. I felt very lucky to be there among the foreign tourists who’d made a greater effort to visit it. We left feeling completely at peace, with ourselves and our surroundings. Spending 3 hours in this vast green haven, made it clear in my mind that all I need is space and freedom to move in order to feel calm, happy, and at peace. Peace, Balance, and Harmony. Take every chance to be outdoors in nature, ground yourself barefoot on cool soft grass or in an invigorating stream. Stand in a place surrounded by trees and breathe in the air they give us. The peace and awe that one feels at Glendalough reminded me of Xavier Rudd – Follow the Sun “take a stroll to your nearest waters edge and remember your place, many moons have risen and fallen long before your came.” We are so fortunate to have Glendalough only an hours drive away. For more thoughts on how outdoor movement helps you to stay young, see Martha Peterson’s blog post: To Clear the Mind and Reawaken The Body You’ve Got To Move. We completely agree with you Martha! A decade ago, I worked in IT. At first I loved my job, travelled a lot, and had great managers, who taught me so much. By my third year in however, I had gained 2 stone, was suffering from low back pain, low energy, insomnia, and spending a huge chunk of my wages on various healing remedies, including phsyio, chiropractic, counselling, alcohol, cigarettes and anti-depressants. After working all day, and not eating properly, I would get home after 7pm, and veg out on the sofa in front of the TV with a takeaway and a bottle of wine. I resented the long hours that work demanded, and found I had little time at the weekend to get chores done and be ready again for Monday. My energy was zapped. I lived for holidays, rarely investing my weekday time in my health or in doing things I loved like developing talents and hobbies. It goes without saying I was becoming less fun to be around! Luckily, I had great support from my managers, who encouraged me to go for Cognitive Behaviour Therapy and get back to myself. So, what did that mean? Mostly it meant a better diet and a lot more movement day to day. I took up aqua-aerobics in the evening, swimming and Pilates during my lunch-break, joined a gym, tried Gymnastics, and remembering how much I used to enjoy practicing yoga, joined a weekly class. Then, a friend showed me the GI Diet book. (Thanks Caitriona!) Being illiterate in home-economics, the whole idea of cooking from scratch and balancing calorie intake with expenditure was completely novel to me! At the grand old age of 25 I made my first quiche, curry, bread, pasta sauce….all the ready-meals I’d been living off now prepared in my own kitchen. The weight fell off. Over ten years has gone by since I decided to daily invest in my health and fitness. The changes I’ve gone through are incredible. I said goodbye to anti-depressants and smoking, and so long to double rum and coke. (Thanks to two kids and sleep deprivation, these days one glass of wine is plenty!) I no longer crave highs because I no longer have the lows. Daily diet and exercise have a HUGE part to play in maintaining my weight and fitness levels. No matter what your day job, there is always a way to improve your wellbeing status from couch potato to 5k a day. And the healthier and fitter you become, the more life opens up for you. You just need to find your motivation. Better quality of life? Better sleep? Better looking? !…happy body, happy mind, happy heart. Looking after my health gave me the confidence to try new sports like surfing, windsurfing, and fun fitness classes such as Adult Ballet, Zumba, Tango and Salsa dancing to name a few. Investing in my hobbies and love of learning has helped to keep me young at heart and improved my fitness. I’ve expressed my creativity in photography and art classes, painting, glass-blowing, stained glass, ceramics, and realised that I also love to cook. Celebrating my gifts and talents, while daily exercising my right to move, is the key to happiness and helping others. It’s hard to be depressed when preparing a vegan meal for your mates, learning some awesome yoga arm balances, or exhausted and elated after your first 20k! Life isn’t perfect. Things happen outside of your control. And some nights bring less than 2 hours sleep. Regardless of life’s curveballs, you can always control the types of food and movement you opt for on a daily basis. The way you move and eat matters. Moving your body throughout the day is my top tip for improving your fitness at work. “If it’s to be, it’s up to me.” It’s true we overestimate what we can do in a day and underestimate what we can achieve in a year. You are responsible for your energy, your behaviour, your thoughts, words and deeds. If you think it you can be it. Manage your energy everyday throughout the day. Is the food you are choosing to eat contributing to your overall energy and fitness levels or is it taking from them? Manage your time outside work to maximise your food options at work. Bake some healthy bars on a Sunday, get up earlier to make lunch, pack a salad and fruit. Meditating for 3 minutes before you eat, or eating mindfully for the first 3 minutes, will improve your mood, and over time, your food choices. When standing or sitting, check your alignment. How we hold ourselves affects our energy levels. Stack your joints so that your feet are aligned with the outer edges straight, take your hips back so the weight is over your heels and the toes can lift. Take your shoulders back over your hips, and ears back over your shoulders. Slide the front bottom ribs down towards your hips. Feel your lower tummy drawing back towards your spine and lengthen up through the crown of your head. Once you realise you’re in charge of your energy and your time, it’s easier to make positive choices. Follow my tips below and you will see your fitness levels soar! Cycle or walk part, if not all, of your journey to work. Get off one Bus or Luas stop before your final destination. Walk a different route to work twice a week, to give your brain visual and mental stimulation. Walk on the textured surfaces that you find, not just on the smooth pavement. This will keep you more alert, and will give your eyes a break from staring at your iPhone or computer screen. If you need to drive, park further away from your office and walk the rest of the way. Keep your trainers to hand or go barefoot in summer. WALK everyday. No excuses! If you have lower body ability, find reasons to walk at work. Discuss project ideas with a colleague at work while taking a walk. Outside. A walking meeting is a great way to squeeze exercise into your busy workday. Take the stairs instead of the lift. Walk over to someone’s desk at work rather than calling them on the phone. Walk up escalators rather than standing still. Fill your water bottle from the cooler two floors below. We need to walk 3-5 miles per day to keep our joints healthy and our bones strong. Maximise your lunch-break with a 15-20 minute brisk walk. Wear a pedometer to track your mileage. If you have more creative walking ideas, I’d love to hear them! Stand while talking on the telephone. Perform head, neck and shoulder rolls: Chin to chest, chin to ceiling. Right ear to right shoulder, back to centre, left ear to left shoulder. Roll your arms and shoulders forward and back. Stretch your arms overhead, and side to side. Swap your chair for Chair Pose: http://youtu.be/zFWIGX0xYJU Put the “OUU” into Utkatasana as you sit back (bum out!) and down. There’s a reason why they call it “Powerful” Pose…raise your arms up if you love to Chair! Squat for 10 seconds, sit, twist your torso from side to side, then stand again. See if you can get the person on the phone to squat too. Build up to 1 minute squats. Set an alarm on your laptop to remind you to stand,stretch,squat every 45 minutes. Set up a squatting time challenge with your desk neighbours and reward the monthly winner. 20 hours squatting in 30 days deserves at least a free ticket to the cinema! Katy Bowman’s Beginner’s Squat. Work towards heels on the floor and knees back over your heels. Check your alignment. Again. How far forward of your neck did your head travel when reading that last email?! Stack your joints so that your feet are aligned with the outer edges straight, take your hips back so the weight is over your heels and the toes can lift. Then take your shoulders back over your hips, and ears back over your shoulders. Slide the front bottom ribs down towards your hips. Arms by your sides, draw your triceps towards your waist, and allow your shoulders to travel down away from your ears. When typing keep your lower arms and wrists straight, bending from your fingers rather than your wrists. See my blog posts on wrist stretches for some easy examples you can do at your desk. When your body is properly aligned, your muscles will tone naturally. Lower leg stretches and squats are two of the best things you can do at work to improve your pelvic floor alignment and core strength, both of which are affected by prolonged sitting on your tailbone. Sit forward on your sit bones and keep a small curve in your lower back while drawing your lower tummy towards the back of your chair. Check out my posts yoga for pelvic floor health. Regular movement classes that teach correct alignment, balance & weight-bearing exercises, will help you to maintain a healthy body, and up your fitness at work. Bad chair. Good chair pose squat!